Interesting Quiz from the New York Times. 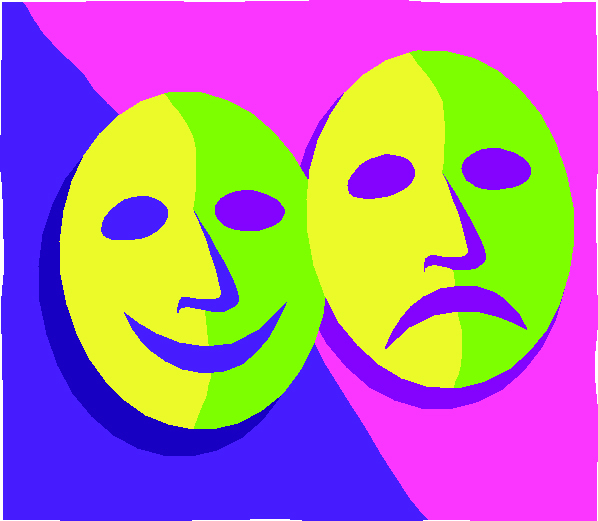 It takes you through 36 facial expressions – eyes only – and asks you to choose which of four emotions are being expressed. How will you fare? Posted on December 27, 2013 Categories ThoughtfulTags Conversations, Interesting Quiz1 Comment on Can You Read People’s Emotions? The Old Man in Storr shawlette that I just completed was easy enough and small enough to take with me when I carpooled with colleagues to a presentation last week. I was a bit hesitant about taking knitting with me “in public.” While I take hand-work (usually, cross stitch) to conferences when I’m one among dozens (or hundreds) in the audience, and use the cloak of relative anonymity, this was me with two close colleagues in a car for a hour-long ride, so I wasn’t sure whether they would think it rude of me, or whether I could focus on the conversation and keep track of the knitting. Both (conversation and knitting) worked out just fine. My knitting sparked comments about their family members’ knitting, and we talked about the project for about 45 seconds, and then went back to our work-related discussion. No big deal. I normally don’t care to car-pool (independent person that I am), but for this conference, it seemed silly for all three of us to drive to the same destination an hour away, and I really appreciated having someone else at the wheel. In the future, I may keep this in mind when someone else offers to drive – I just hope I have some portable knitting ready to go (another reason to always keep a sock project on the needles!). What are your thoughts about “knitting in public”? 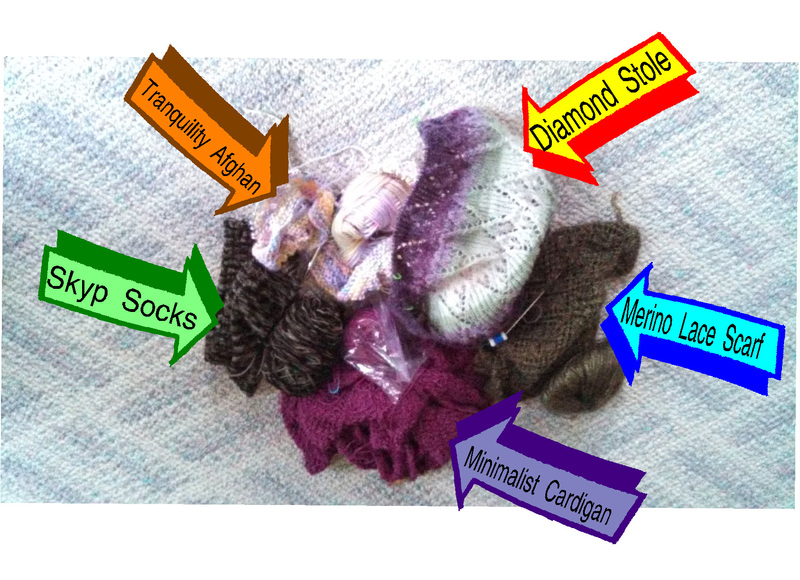 See the comparison – This was sock yarn, for crying out loud. One assumes that one can regularly wash sock yarn. Son wore it once, washed, and there you go – shrunk to half the size. Doesn’t even fit me. Sigh. This week is our County 4H Fair. I volunteered to sit at the booth of one of the organizations I support to sell raffle tickets and answer questions about the organization and its projects. I took knitting to keep my hands occupied, and brought the daughter to help with errands – I’m still careful on the ouchy ankle. Didn’t sell a lot of raffle tickets, but I generated a lot of interest with the knitting. Many knitters (and crocheters) stopped and asked questions about the project, and even “non-crafty” folks stopped by for a comment. 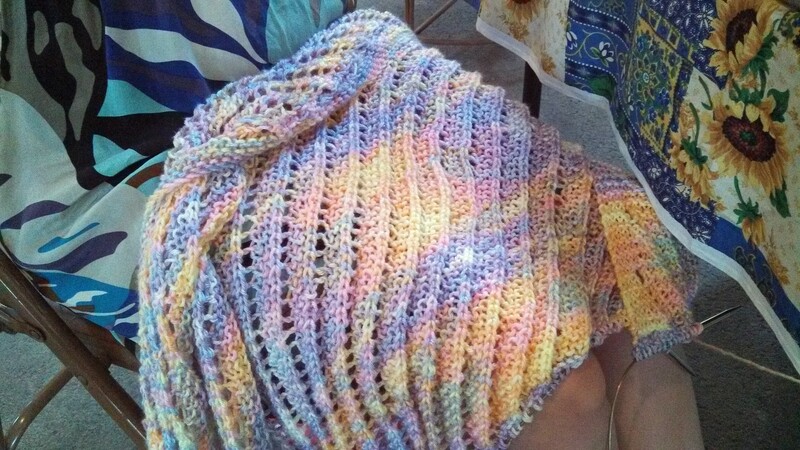 Most of them asked why I was knitting an afghan in 90+ degree heat, but I had already finished the socks, so this was the next best thing to bring out. Photo of the afghan on the daughter’s lap – only one more skein to go, and this will be done! Do you take knitting out in public? What do you take, and what kinds of comments do you get? This is a hand-formed wooden bowl I found at a Farmer’s Market in Indianapolis a few years ago. For a short while, it sat on a shelf as a decorative piece, and then, for no apparent reason, ends-of-project yarn balls started accumulating in it. After the first few, it became sort of a ritual – project done and dusted, leftover yarn ball in the bowl. The bowl sits out in the open, mostly unnoticed, but occasionally commented upon. I like the concept – for my own purposes, I can simply glance at the bowl and recall the projects represented by each small ball. As I finish a project and add a ball to the bowl, it joins the collected memories of hours and projects in a bit of eccentric nostalgia. For what it’s worth, it’s not my “official” record of projects – that is found here on the blog, and in a notebook I keep with a a few yards of yarn, the yarn band, and the project. The bowl is just a more fanciful representation. I think I need a bigger bowl, though. Either I have a short attention span or a case of “can’t-complete-it-itis” (or both). I definitely am NOT a monogamous knitter (oh, my). All the several, nearly forgotten, currently ignored knitting projects that won’t be mentioned in this post, or I will be here all day. NOW – my problem is that I don’t have Size 7 (US) circular needles available, because they are being used other projects! So, I can’t start the sweater I have in mind. This problem prompted me to consider changing needle sized for the Cardigan sleeves – because I think that’s where one of my Size 7 sets is being used. Or, I could order Addi-turbo Click Size 7 ends. Too much? So far, the pile is just manageable. Not sure what will happen when I add “the next project.” Somewhere, sometime, there is probably a “one-too-many” project. Will I know when I get to that point? Spent some time with B last week between continuing education conferences. She had a meeting in the evening before we went to dinner, so I said I would go with her and just knit and wait. I don’t usually “knit-and-wait,” so this was a new experience for me. Other than the extremely hard bench I was sitting on, it was rather relaxing, and a pleasant way to spend the time. 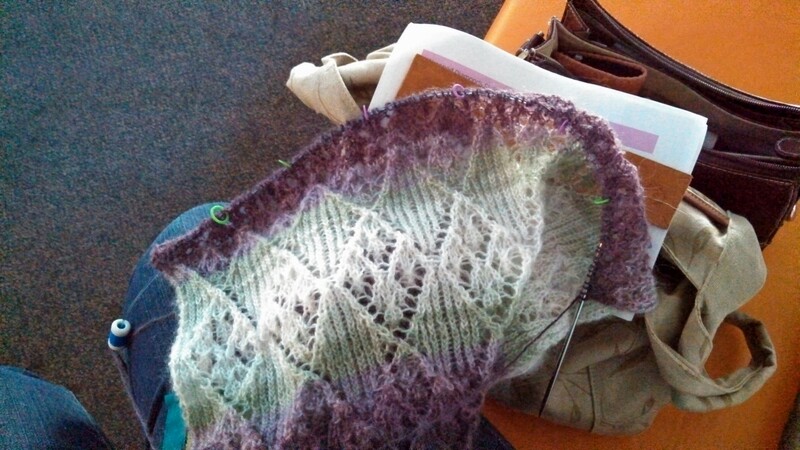 Oh, and I was able to capture a better picture of the WIP – Diamond Stole. My usual “conference project” is cross stitch. I’ve always been afraid that if I took knitting, I would lose my place when I had to turn my attention to the speaker, or jot down a note, or what-not. 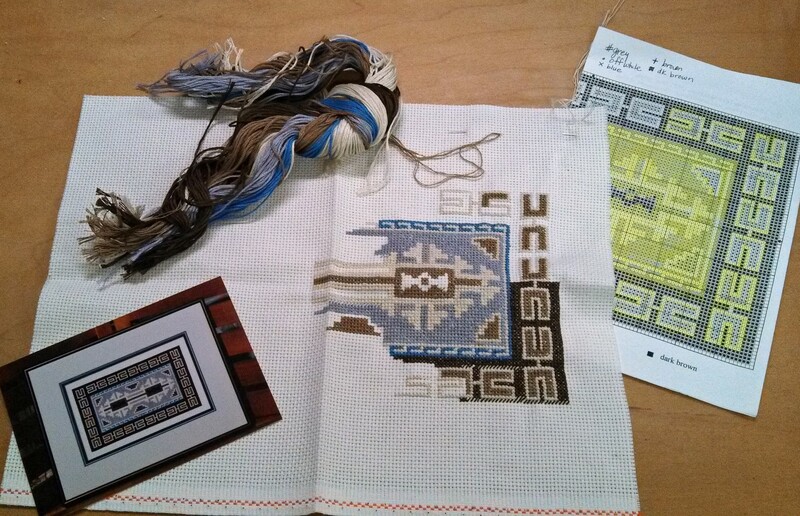 Also, I’ve been cross stitching a lot longer than I’ve been knitting, so the cross stitch habit was well-engrained. And, it makes a nice change from knitting. The current “conference project” is the second of three Navajo rug reproductions I picked up on a trip to the Grand Canyon. I love the colors and the geometric shapes. It’s a smallish project which I can hold in my hand – I don’t like to use hoops for smaller projects. The name is “Teec Nos Pos,” which is the name of a Navajo community in Arizona. I don’t think the kit or chart is available commercially, but I haven’t looked.